This is singlehandedly one of the most bizarre flavour combinations i’ve done on my blog or YouTube channel… However it works really well. If you haven’t tried these before and like something a little different, this is the recipe for you. To make the bacon candied, you’ll want to take your rashers of bacon and give each side a coating with light brown sugar, then place on a baking tray and bake in the oven for 15-18 minutes at 160˚c/320˚f. Once done, transfer to a plate and allow to cool fully. Keep enough bacon back to place a small piece on top of each cupcake (1 piece for 6 cupcakes or 2 pieces for 12 cupcakes). 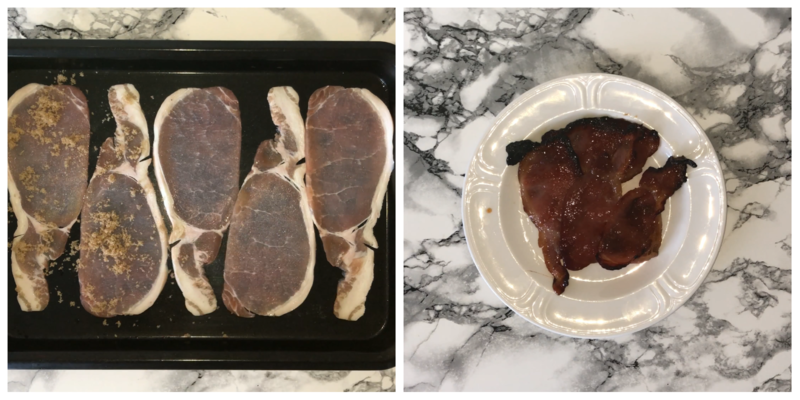 The bacon isn’t just your standard type you’d have on your fry up – it been candied, which adds a different flavour and makes it sweet, savour and bacon-y. The first bite is a little confusing as you’re not expecting it to be sweet but it hits you with the sweet, the savoury and maple flavour. I used quite a lot of maple syrup in the recipe but it balances well with the bacon and adds a distinct flavour of its own (which isn’t a bad thing, it all ties together and turns out well). The cupcake isn’t too different to my usual recipe, it uses light brown sugar over granulated white sugar (to add a certain caramel-y flavour to it, this works wickedly well with the flavours) and the buttercream isn’t a basic buttercream (butter, icing sugar and favouring), it’s my favourite Italian buttercream, which is richer and smoother and not overly sweet compared to a basic buttercream. Making the cupcakes isn’t overly hard, you’ll want to use the creaming method to mix the cake. This is where you start by adding the butter and sugar into your mixing bowl and beating the two together until they are very well incorporated, you can tell when this stage is done as the mixture will be lighter and fluffier in colour and consistency – this can take up to 5 minutes using an electric mixer (stand or hand). Once the butter and sugar are light and fluffy, you can then add your eggs and maple syrup, beating well in-between each addition. Once the eggs and maple syrup have been fully incorporated, you can give the bowl a quick scrape down (this is just to incorporate any bits that may not have been fully worked in). Next comes adding the plain flour, baking powder and salt but make sure you pass it through a sieve first to remove any lumps that may be in the dry ingredients. Once in the bowl, mix them in to incorporate on a medium speed. Be careful not to over mix the cake batter at this stage, otherwise the cakes will turn out tougher in texture. Once your dry ingredients are just about incorporated, add in your chopped bacon and mix again just enough to fairly distribute the bacon in the cake batter. Now that you’ve got your batter done, you can divide it between your cupcake cases. You can fill a piping bag with the cake batter and pipe an equal amount into each case or using two spoons, spooning equal amounts into each case, then place into your preheated oven and bake for 20-22 minutes (or until well risen and a tester comes out clean). Allow to cool fully before finishing them. The buttercream takes a little longer to make but is totally worth it. Start by placing the water and sugar into a small saucepan over a medium-high heat until it reaches 121˚c/250˚f – this takes about 5-7 minutes. 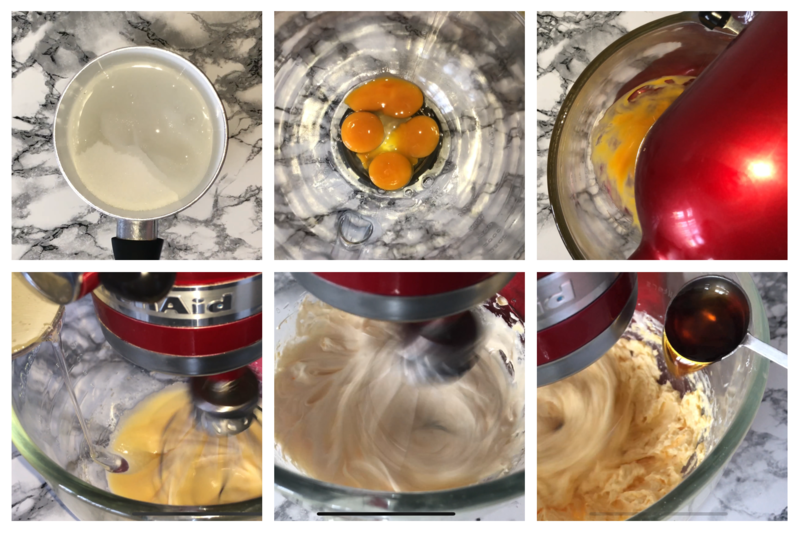 While you wait for the water and sugar to come to temperature, you can place your egg and egg yolks into a mixing bowl and beat them together until lighter in colour and consistency – this doesn’t take very long. Once the sugar water mixture has come to temperature and your egg mixture is ready, you can slowly and steadily start to pour the hot sugar water mixture into the egg mixture – do this on the lowest speed your mixer can go. Once all the liquid has been added, switch the mixer onto high speed and mix until you can touch the bottom of your bowl. 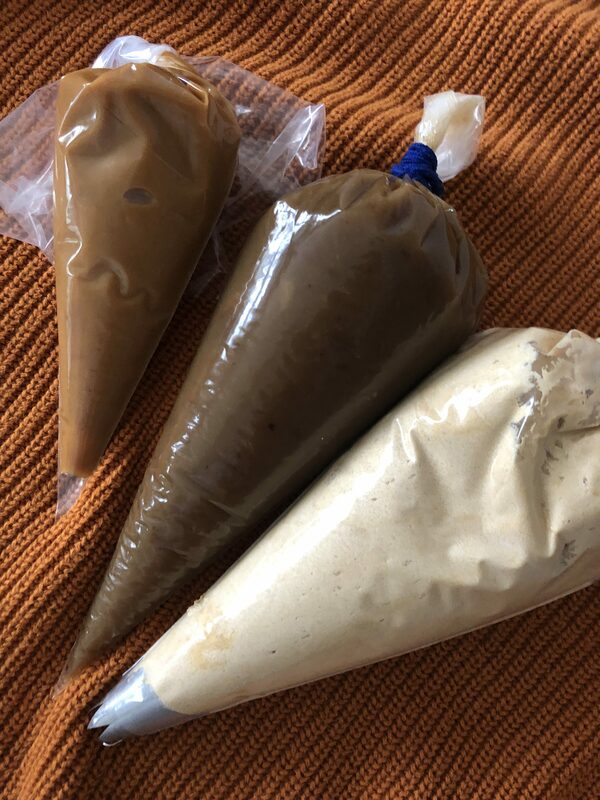 Once the bowl is cooled down enough, start to add your butter a little at a time, allowing it to beat in well – once all the butter has been added it will look sort of like butter but this is normal, once it’s flavoured and placed into a piping bag it doesn’t look so much like butter. Once all the butter has been added, feel free to flavour it with some maple syrup, you can add more or less to suit your preference. To finish the cupcakes, you’ll want to place your buttercream into a piping bag fitted with a nozzle (I opted for my favourite open star tip but use whatever you prefer). Then go ahead and pipe the buttercream onto each cupcake, then top with a piece of bacon and optionally, drizzle over some more maple syrup. So that’s my recipe for maple bacon cupcakes, I hope you enjoy. Don’t forget to let me know if you make one of my recipes. Don’t forget to check out my social medias and YouTube channel. 8 Rashers of bacon, chopped. Maple syrup (flavour to suit you). If you’re looking for an autumnal cupcake recipe, look no further. 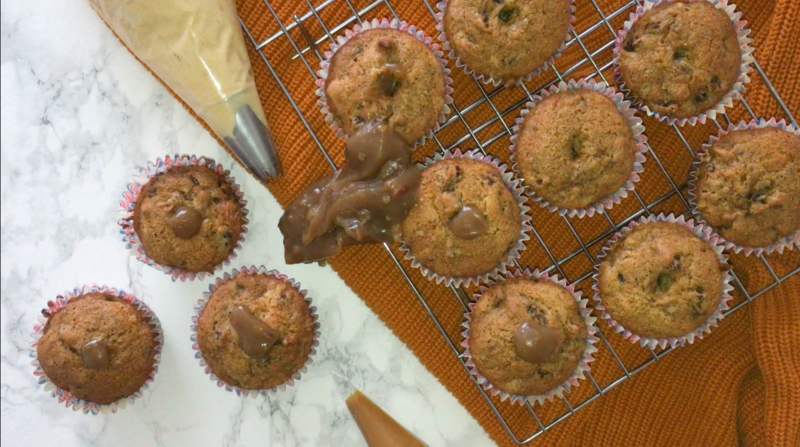 This week’s recipe is for sticky toffee cupcakes, let’s get started shall we? I know that normally around this time of year everybody goes crazy for pumpkin and pumpkin spice, not from me (well this week anyway, perhaps next week? 🤔). 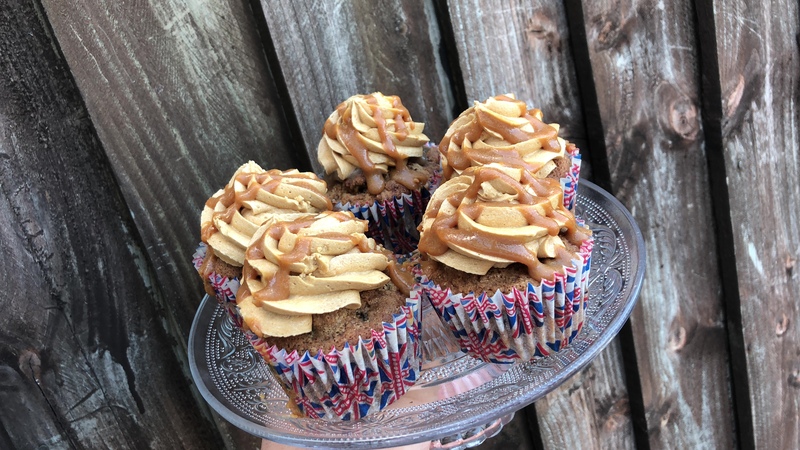 Anyway, these cupcakes are made up of a traditional sticky toffee cake base, which is filled with a caramel pecan filling and topped with slightly salted caramel buttercream (which works very well) and finished with a drizzle of caramel sauce. Who wouldn’t want one of these? These cupcakes aren’t exactly hard, there is step that you don’t have to do with other cakes and this is to soak the chopped dates, sultanas and bicarbonate of soda in boiling water. You may ask why you do this. Well, it’s to soften the skin on the dates as they can be quite tough in texture and it helps to make them taste less like dried fruit and have a more ‘toffee’ flavour, somewhat. Apart from this stage, the rest is the usual method. As always, just before you intend on baking you’ll want to do some prep work. Line your muffin/cupcake tin with cases and set aside until its needed later, you’ll also want to weigh up all your ingredients (this saves you making mistakes later and stops you faffing about) and preheat your oven to 180˚c/350˚f. The final bit of prep you’ll need to do is preparing your dried fruit. 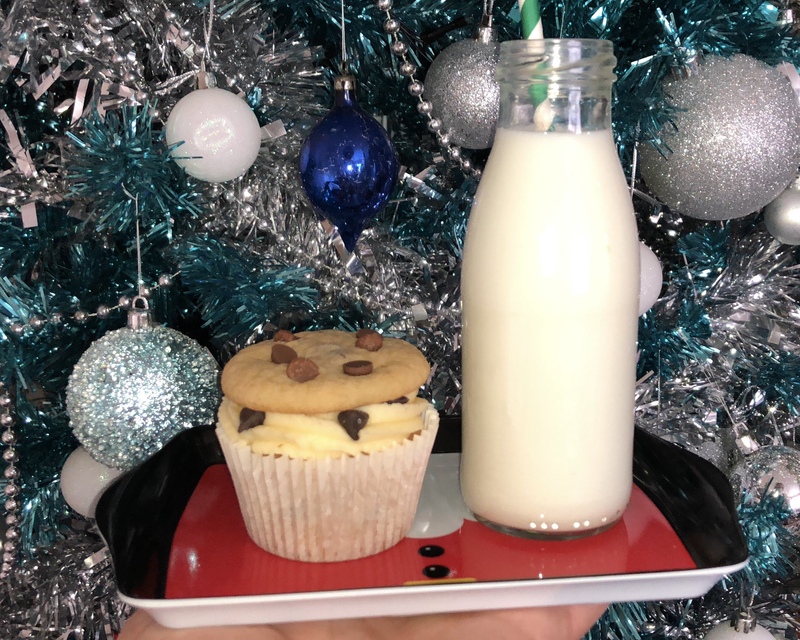 Place your sultanas, chopped dates and bicarbonate of soda into a small/medium heatproof bowl and pour enough boiling water on top to cover and leave to soak while you carry on and make your cupcake batter. Once you need them, simply pass them through a sieve and add the fruit mixture into the cake batter. Now you’ve got your prep work done, you can start making your cupcakes. Start by getting yourself a large bowl and placing your butter and light brown sugar into it, then mix the two until they are combined. Then add in your eggs, 1 at a time, beating well in-between each addition. Try your best to not scramble the mixture at this stage, you will also notice that the consistency will change at this point, don’t worry. Give your bowl a quick scrape down before continuing. Next, you’ll want to sieve your dry ingredients into your mixing bowl and mix on a low-medium speed until the flour is just about incorporated, once you’ve achieved this, you can add in the drained date mixture and then incorporate that by hand using a silicon spatula or whatever you have. Just mix until it’s fairly distributed, try not to over-mix at this stage, otherwise your cupcakes will be tough textured. Divide the cake batter between your 12 cupcake cases, I used 2 spoons but feel free to use whatever you have or find easiest to work with. Then place the tray into the oven and bake for 20-22 minutes (or until golden brown and well risen, a tester works well too!). While your cupcakes are in the oven, you can make your caramel pecan filling. To make the caramel pecan filling, you’ll want to get yourself a small-medium saucepan and place the butter, light brown sugar, double cream and chopped pecans into it and place on the hob until it’s melted and come together. Ensuring that you’re stirring constantly once it starts to melt, once everything has come together and the mixture is smooth, transfer the mixture from the saucepan into a small heatproof bowl and allow to cool completely before using it. Depending on how much time you have left, you can start making your buttercream, this is really quick and easy. Into your mixing bowl of choice place your butter and half of your icing sugar and mix on a low speed to start with, just to get them combined, then work your way up to a medium-high speed and mix for a couple of minutes, until roughly light and fluffy. 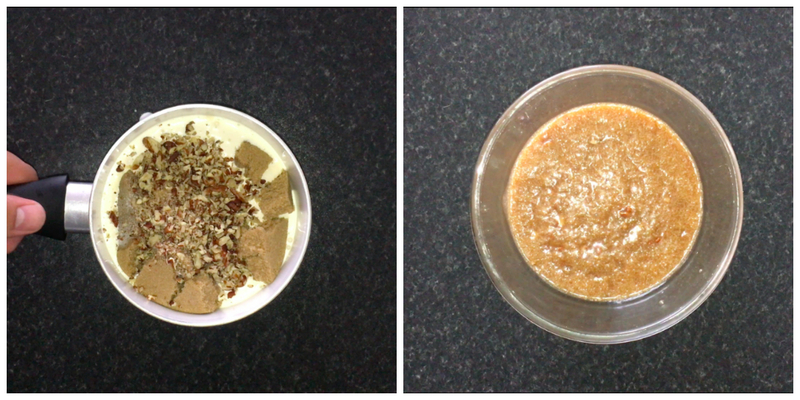 Give your bowl a quick scrape down and add the other half of icing sugar. I used half normal icing sugar and half salted caramel flavoured icing sugar (available at most supermarkets, craft shops and online). I then repeat the mixing process until I have no icing sugar left and the mixture is looking light and fluffy, set aside until needed a little while later. Now that every element behind the cupcakes has been made, you just need to allow everything to cool completely before using anything. When you’re ready, you’ll want to do some prep work. Get yourself 3 piping bags, 1 for the caramel pecan filling, 1 for the salted caramel buttercream (fit the piping bag with a piping nozzle of choice, I opted for the 1cm open star nozzle but choose what you like) and 1 for the caramel you’re going to drizzle over the cupcakes (for this you can make your own caramel or use some from a can, which is what I went with on this occasion). Doing this now saves you time in a little while and allows you to crack on when you’re finishing the cupcakes off. So, to finish the cupcakes, you’ll want to start by getting your cupcakes in-front of you and using a shaping tool (or something similar), make a cavity in the middle of the cupcake. Snip the end off your caramel pecan piping bag and pipe a generous amount of the filling into the centre of the cupcakes (a small blog may appear on top, don’t worry to much about this, it’ll be alright). Now be aware and make sure that you’ve used a good piping bag and have snipped a big enough hole in the piping bag an aren’t applying too much pressure, otherwise you’ll make your bag explode and it’ll make a mess, like a serious amount. GRR! 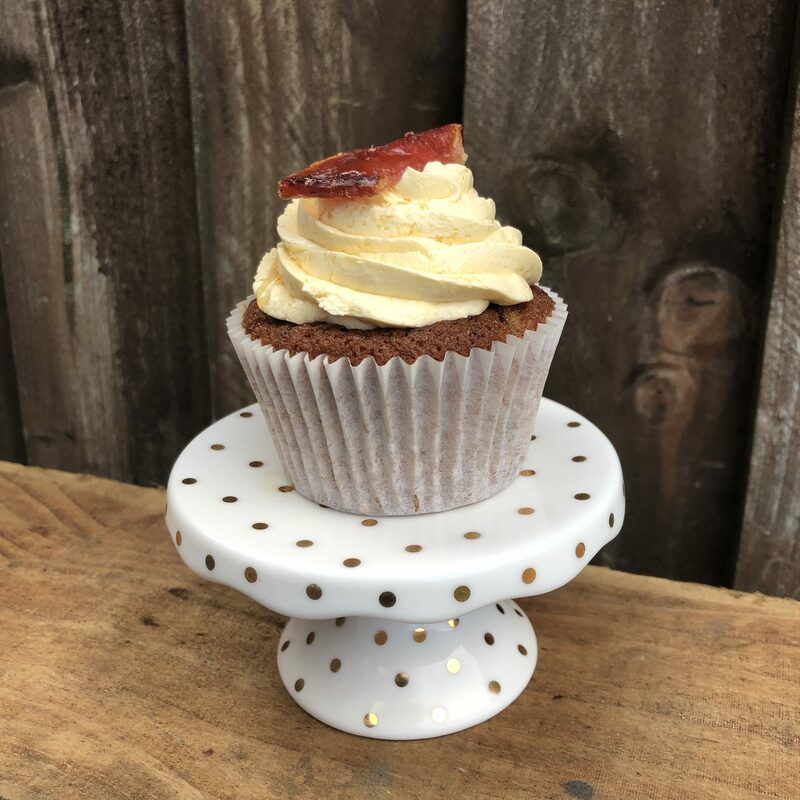 Fill each of your cupcakes with a generous amount of the filling and then get your buttercream piping bag ready and pipe a good amount of it on top of each cupcake, this is where you have control and can pipe onto each cupcake the amount you want, so it’s fully customisable. To finish the cupcakes, use the final piping bag containing the caramel and snip a small hole in the end of the bag and drizzle over as much or as little as you’d like onto each cupcake. That’s how you make the cupcake, which sounds like a lot of work but when you consider that you’ve made almost all the elements to the cupcake it’s all worthwhile! 250g Salted caramel icing sugar. Canned caramel (for the drizzle). Do some prep work before you get started, prepare your cupcake tin with some cupcakes cases, use whichever you like or have. Weigh up all your ingredients and preheat your oven. The other bit of prep you’ll want to do is placing the sultanas and chopped dates into a bowl and sprinkle over the bicarbonate of soda then cover it all with enough water so its submerged. Allow to soak until you need it, a little later in the recipe. Place your butter and light brown sugar into a mixing bowl of choice and beat until they are combined. Add in your eggs, 1 at a time, beating well in-between each addition. Repeat this with method with both eggs and try not to scramble your mixture at this stage. Scrape down the sides and bottom of your bowl quickly. Add in your flour and baking powder and mix on a low-medium speed just until combined, be careful not to over mix at this stage. Drain your fruit mixture and add into your cake batter and fold in by hand until its fairly distributed. 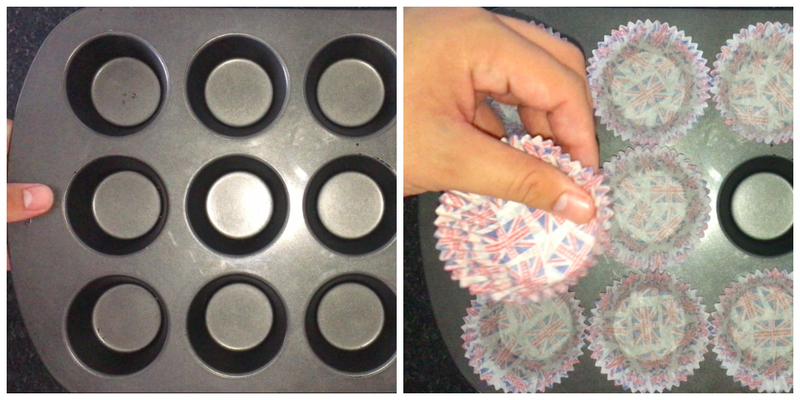 Divide the mixture between your 12 cupcake cases, trying to get it as equal as possible. Then place the tray into the oven and bake for 20-22 minutes (or until a tester comes out clean). Allow them to cool completely before using them. To make the filling is really easy. Get yourself a small-medium saucepan and place in your butter, light brown sugar, double cream and chopped pecans and place on the hob over a medium heat. Once the butter and sugar start to melt, make sure you’re constantly stirring the mixture so it doesn’t catch on the bottom of the pan and burn. Once everything has melted and has combined, you’ll be left with a smooth (apart from the lumps from the pecans) mixture. Transfer from the saucepan into a small heatproof bowl and allow to cool before using. Once the mixture has cooled completely, you can transfer it to a piping bag and use accordling. Get yourself a mixing bowl and place in the butter and half the icing sugar, mix the two together on a low speed to start, once combined then crank up the speed to a medium-high just until it looks lighter and fluffier, then add in the second weight of icing sugar and repeat the process with the remaining icing sugar. Set aside until later on, where you’ll want to place it into a piping bag fitted with your choice of piping nozzle. Make a cavity in each cupcake by using a shaping tool or something similar, then fill each of them with a generous amount of the filling. Onto each cupcake, pipe a good amount of the salted caramel buttercream. Use as much or as little as you’d like, it’s really up to you. To finish the cupcakes, get your final piping bag which has some canned caramel in it and drizzle over as much or as little as you’d like. That’s it, you’re done! Congrats – what do you think of these cupcakes?